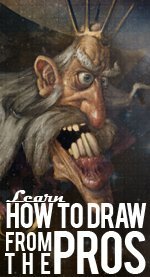 You can really bring home the bacon by learning how to draw a cartoon pig. Follow our simple steps on how to draw a cartoon pig and you’ll soon be impressing friends and family with your awesome sketching skills! STEP-2: Let’s Fatten our Pig Up! Now that we’ve drawn the basic outline, the next stage in how to draw a cartoon pig involves adding some more details. Add some chunky cheeks by drawing two oval shapes either side of the head. Now, let’s add an arm on the left-hand side – this is partly obscured by our farmyard friend’s round stomach (pigs just love to eat), so you needn’t make this too thick.Next, draw two ‘W’ shapes for the legs and trotters at the bottom of the body and finish these off for now by drawing a curved line roughly in the middle of each – these represent where the trotter ends and the leg begins. STEP-3: Bringing our Porky Pal to Life! Wow, our farmyard friend is really starting to take shape! Let’s now add some character to that wise, relaxed face by drawing a chin – following the line of the circle we drew for the head, draw an irregular line to give that chin some texture. You can also make the top of the head a little less regular – the circle is only a guide. Now, let’s add another arm. On the right-hand side, draw two slightly curved vertical lines – the line on the left should be slighly longer and a sort of ‘l’ shape. The trotter is another ‘W’ shape which joins up with the rest of this arm. Don’t forget to finish off each arm (or leg) by drawing a curved horizontal line, just like we did with the legs. You see? Learning how to draw a cartoon pig is easy when you know how! Now, let’s really go the whole hog by adding some more features to make our pig look mighty ‘swine!’First, draw some ears – pigs have an excellent sense of hearing, but their eyesight isn’t so good. Draw two curly shapes either side of the head. Next, it’s time for some eyebrows – draw the left-hand one as an upside-down ‘V’ shape with a smaller ‘V’ beneath, then imagine you’re drawing the side and top lines of a box for the other eye – again, draw the same shape slightly smaller beneath. No piggy is complete without a snout – our farmyard friend has an awesome sense of smell and often finds work in Europe sniffing out truffles – a rare form of fungus which is considered a delicacy in Italy and France! To draw the snout, draw a broken circle and then, for those all-important nostrils, add two narrow oval shapes. We can now add a little more detail to the chest by drawing two curved lines as in our illustration. Then, add a belly button towards the bottom of the stomach. STEP-5: Perfect Piggy is Nearly Ready for Action! This little piggy is nearly ready for the movies, but we just need to add in some more details. Remember those eyebrows? Let’s now draw some eyes by drawing two irregular circles with a smaller circle inside for the iris and an even smaller one inside for our piggy’s pupils. Make the eyelids a little droopy to give our farmyard friend that famous laid-back look. Next, for the mouth, draw a smile just beneath the snout, with a shorter line beneath to represent the bottom of the lip – this helps add a sense of 3D to our awesome creation! Now, get those pink felt markers at the ready, because it’s time to add some hue to our hog! Rub out any lines you don’t need and then draw round the outline in brown. Pigs come in many different colors (some even have spots!) but the most commonly used is pink, so that’s what we’re using here – color in the body using one shade. For the area just beneath the eyebrows, use a darker shade of pink to suggest shadow. You can also use this color for our perfect piggy’s nostrils. Use a brown to color in the eyebrows and a nice bright blue for the eyes. The pupils are black, but remember to leave a small area white to give us a highlight. Now, using your brown pen, make the outline of the snout and the mouth a little thicker – this really makes them stand out and gives our movie star swine real personality! We’re done! Now that you’ve learned how to draw a cartoon pig, why not practise drawing some other farmyard friends?